By Tanisia Morris on April 26, 2017 for Fordham News. More than 1.9 million people in New York City are living in poverty, according to statistics from the Robin Hood Foundation’s Poverty Tracker. At “Social Changemakers: Combating Poverty In NYC Through Innovation,” a conference sponsored by the Gabelli School of Business and the Graduate School of Social Service (GSS) on April 24, some of the city’s most innovative change agents came together to share best practices to reduce poverty levels. Rondo Moses, a consultant and board member of Uncommon Schools, a network of urban public charter schools that aims to close the achievement gap. 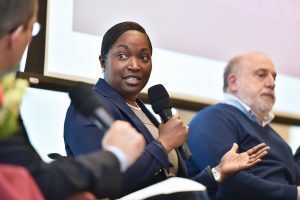 When asked by Struebi how poverty has changed in New York over the past 10 years, Moses said poverty has become more complex and is difficult to define on a uniform level, particularly in New York. “Living in urban communities like New York City, you have to take into consideration basic living costs—housing, clothing, food, [and]transportation. When you take that into consideration, there are so many people actually living in poverty,” he said. 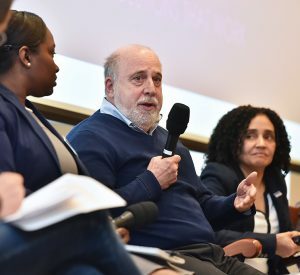 Tobin said an “access dilemma” and systemic lack of investments in poor communities has caused residents of Brownsville, Brooklyn, to remain impoverished as other areas of Brooklyn experience growth. In Brownville, 36 percent of residents live below the federal poverty line. The neighborhood also has the largest concentration of public housing in the country. “You can see glaring pockets of prosperity and improvement in education, and people’s access to opportunities, but in Brownsville it’s economically depressed so you’ll see the poverty levels increasing,” said Tobin. For Lizardo, some investments come with a price. She shared that the gentrification of areas in Inwood and Washington Heights has led to the displacement of low-income residents. “Washington Heights and Inwood were the forgotten parts of northern Manhattan, but now we’re the ‘it’ neighborhood and so our families are getting pushed out,” she said. Moses said empowering low-income students to see their education as a way out of poverty can create impact. “When you look at the lifetime economic value of someone with a college degree versus someone who just got a high school diploma, there’s no question that there’s more value in finishing school and getting a higher education,” he said. While New York state is “relatively rich” in terms of services that it offers to the poor, particularly when juxtaposed with other states around the country, Zisser said the challenge is figuring out how to effectively fund organizational and social infrastructures that address poverty and issues that contribute to it. Tobin encouraged leaders to recognize the power of data, which can help to inform decisions. She said “deliberate networking” and taking advantage of business deals that are being brokered in the community have helped to create opportunities for the population her organization serves. “It allows you to really leverage the talents and the benefits that are already in the community just by shifting your perspectives and how you work with your partners,” she said. To successfully tackle poverty, organizations working in the human services sector should create a multiplicity of funding sources, according to Zisser. “You want to diversify funding streams so that no one factor, or no one hit, could upset the balance of the institution,” he said. Zisser said organizations, more than ever, will have to come up with innovative strategies to inspire future donors to invest in their cause.